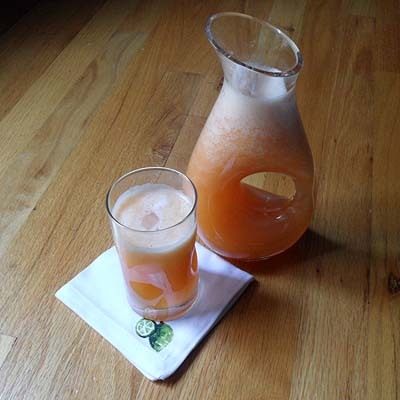 Today on the Kenmore Genius Blog, I’m sharing a quick and simple recipe to make agua de melón in your blender. I especially love to drink this with breakfast. The basic ingredients: Cantaloupe, a little sugar, water and a squeeze of fresh lime juice. If your melon is super ripe, you can also reduce the sugar by half or leave it out completely for a healthier, no-sugar-added version—it’s up to you. Hop on over to the Genius Blog for more on this recipe. This recipe calls for cantaloupe, but you can also use honeydew melon (melón verde). Dissolve the sugar in a half cup of warm water to create a simple syrup. Set aside and allow to come to room temperature. Cut the cantaloupe into cubes and put it into the blender with 1 cup of water until it’s completely liquified and smooth. Place a fine sieve over a pitcher and pour the contents of the blender through it to strain. Use a spoon to press any remaining juice through the sieve. Add the simple syrup to the pitcher and stir well. If you opt to use the lime juice, add that after the simple syrup. Serve chilled or over ice. Yields 3 to 3-1/2 cups of juice, depending on the ripeness of your cantaloupe. Refrigerate any juice you’re not going to drink immediately and consume within two days. Did you like this recipe? Please share it with your familia and amigos! ¡Gracias! 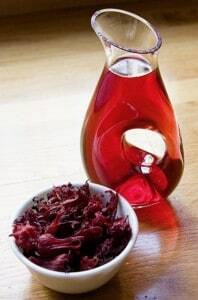 Agua de jamaica is a staple agua fresca flavor made with dried hibiscus flowers. Jamaica (pronounced “HAH-MY-CAH” in English; not like the country Jamaica) is a simple but unique drink, and has only two ingredients other than water. Aguas frescas—literally, “fresh water” fruit drinks—are very common all over Mexico. They come in many flavors: horchata (made with a rice-base), sandía (watermelon), agua de piña (pineapple), limón (lime), tamarindo (tamarind), naranja (orange), agua de mango and so on. There are a lot of places in Mexico where you can buy aguas frescas out on the street, in the market, or as pre-made powder mixes. Most people make them at home from scratch because it’s so easy. Every time we visit family in Mexico, nearly every meal made at home is accompanied by an agua fresca. Jamaica is made like tea, infusing the flavor and purple-red color of hibiscus calyces. Like tea, jamaica is also a natural diuretic so don’t go drinking the whole pitcher in one day. (Yes, I once did that. You might also want to avoid drinking too much jamaica before bedtime.) The only real variation among recipes are the ratios used of sugar to water, and whether or not you dilute the juice (and if so, how much) when serving. Some households serve their agua de jamaica a bit more tart like cranberry juice; we like ours a little on the sweeter side. I dilute it by adding half a glass of water to half a glass of juice. I prefer a brand of granulated cane sugar called Zulka, which is Mexican, non-GMO, vegan-friendly and can be substituted 1:1 with processed white sugar. You can generally find this brand in all Mexican markets, many Latin American specialty grocers and even some mainstream retailers such as Target and Walmart. 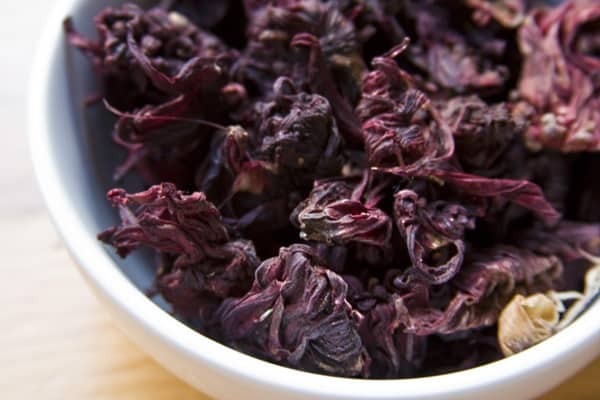 Agua de jamaica is a classic Mexican agua fresca recipe made with dried hibiscus flowers. Bring 8 cups of water to a boil in a non-corrosive pot and add the flowers and the sugar. Stir to wet all the flowers and dissolve the sugar, and allow to boil for 3-5 minutes undisturbed. Remove from heat, stir, and allow to steep and cool to room temperature for about 1 1/2 to 2 hours. Using a sieve over a pitcher, pour the liquid (with the flowers still in it) through the sieve to filter the flowers out. The flowers will have plumped up during rehydration. Press them against the sieve with your fingers or a spoon to extract any extra juice left inside. Refrigerate. When serving, cut with 50 percent water to dilute. Total time includes 2 hours of cooling time for the concentrated juice to come to room temperature before serving or bottling and refrigerating. *This recipe is vegan-friendly when using Zulka morena sugar.